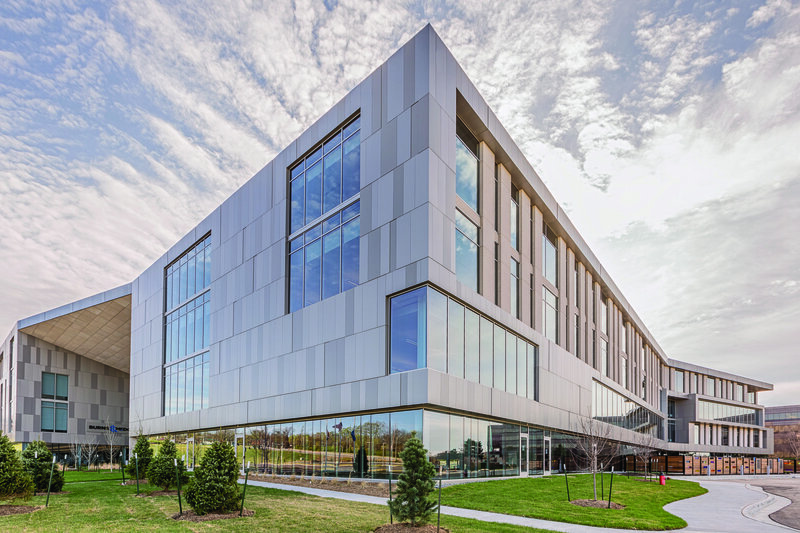 When you’re an engineering, architectural, and construction firm, and 100 percent employee-owned, satisfying all constituents during your world headquarters expansion is a daunting task. Kansas City, Missouri-based Burns & McDonnell set out to increase their headquarters by 74 percent and accommodate 1,400 additional employees, requiring a new four-story, 310,000 sq. ft. facility—the third building on the firm’s 37-acre campus. To make this expansion a reality, Burns & McDonnell knew that having the right partners on board would be key. From an opening perspective, they needed a partner who understood design build construction methodology and could coordinate doors, frames, and hardware to meet building management’s security and access control requirements. They needed a partner who also understood architectural and design team’s aesthetics and functionality needs, and the construction team’s budget and schedule. American Direct was hired as a design build partner to meet with the various constituencies in order to determine their needs and then write specifications to meet their requirements. Working in conjunction with the architectural design team, American Direct was responsible for reviewing compatible and equal products in order to confirm that the products desired, and ultimately selected for use on the project, would function as intended. American Direct worked directly with and coordinated between the architectural team, the building management team, the security team, and the construction team, and ensured that the products selected and installed on the project met the look, function, and budget as desired by Burns & McDonnell. American Direct wrote the specifications and section preambles in a non-proprietary format, thereby eliminating possible “No Sub” price escalation to ensure maximum value for the client. When all was complete, American Direct provided doors and hardware for the 425 openings, specified finish hardware and door parameters to meet project requirements, and worked directly with the owner’s representatives, the owner’s architectural team, and the construction team to complete this design build project. Kudos to the Burns & McDonnell team for taking full advantage of the variety of value-add servicesand expertise American Direct brings to the table making this a showcase project for all partners.